Climate change campaigners claim they have locked down the Department for Business, Energy and Industrial Strategy to protest the department’s support for fracking. 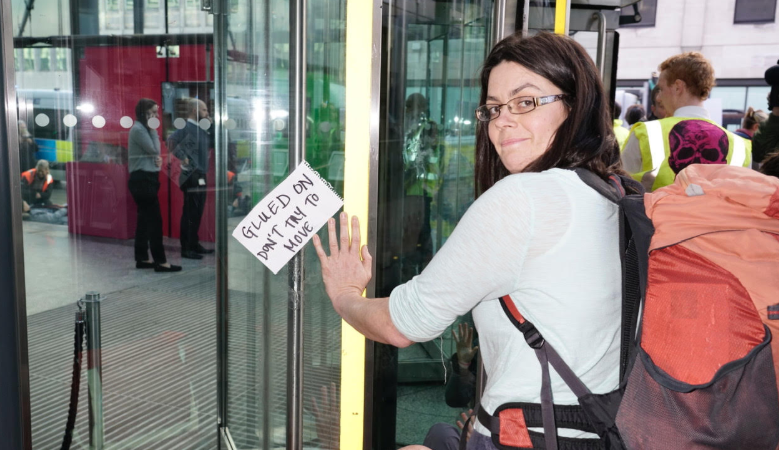 Activists from the Extinction Rebellion group glued themselves to the doors and sat down in the lobby and said that fracking is “causing havoc” across the UK. In one case, a whole family has got involved in the protest as Becky Daniels, her mum and her aunty all said they support the campaign of civil disobedience against government inaction on climate change. “The time to take action against climate injustice is now. The political system is failing us from local councils to central government. Democracy no longer exists, as seen with England’s ‘dash for gas’ and the systematic criminalization of peaceful protest. “The government has failed us all. We will not sit passively while the climate and our civilisation breaks down. We are rebelling in order to protect all life, and we will escalate until we win. The issue of the climate is the very stuff of survival. The safe quality of our air, water and soil must be addressed now as a matter of urgency. The government must face us and face up to its responsibilities – the decisions made now will bring the wrath or gratitude of future generations. Our children demand this civil disobedience of us. We are non-violent but what we demand is non-negotiable”. Extinction Rebellion said that the government is promoting fracking after meeting with fracking companies more than 30 times in the last three years, compared to zero times with anti-fracking groups – despite massive local opposition with protesters across the country. Last month, Left Foot Forward revealed that a government minister had produced pro-fracking propaganda which they called a “mythbuster”. Friends of the Earth countered with a detailed take-down of the government’s arguments. Extinction Rebellion is a new campaign group which aims to use non-violent civil disobedience to pressure the government into drastic action against climate change. On October 31, Extinction Rebellion activists were arrested for blocking a road near Parliament. One of those arrested, an ex-serviceman called Steve Masters, told Left Foot Forward that he was willing to be arrested because “the government is doing nothing” despite a recent report warning the world has less than 12 years to tackle climate change. Climate campaigner Tim Root wrote for Left Foot Forward that campaigns like Extinction Rebellion need to target villains in order to win. By targetting the business department, the campaigners seem to have taken on this advice. Joe Lo is a freelance investigative journalist and writes for Left Foot Forward.